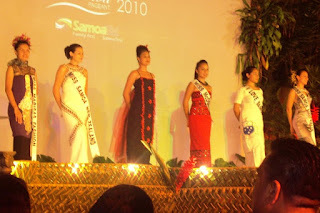 There’s a small subset of you who read the blog pretty regularly, and then there’s far more sizeable group who Google “Miss Samoa” and inadvertently stumble across my blog. I really like having all you loyal readers out there checking in day in and day out—I think you’re all the driving force behind me maintaining the blog (I admit maintenance has been poor lately.). But I also like having the Googlers pass through. Guys, this one’s for you. I was exhausted when we rolled back into Apia this afternoon, and so I opted out of attending tonight’s beauty pageant. Luckily, Blakey was all about going, and she was nice enough to take my camera. You can thank her for the photos. I’m going to shut up now. No one Googles for the articles. I hope you’re well. Pictures below. The contestants in their traditional wear made from natural materials. Left to right: Miss I Love Samoa, Lagitualua Ita Fiso; Miss McDonald's, Jolivette Menime Ete; Miss Apaula Heights Lounge, Sasaai Ietli Tiatia; Miss Samoa New Zealand, Maree Angelica Wright; and Miss Marisa's Fashion, Maria Tupou Woo Ching. Miss Samoa Australia, Sallie Maryanne Wulf Peterson, is not pictured here. 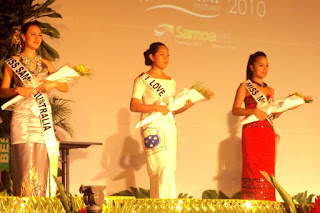 Miss Samoa Australia, Miss I Love Samoa, and Miss McDonald's waiting for results. 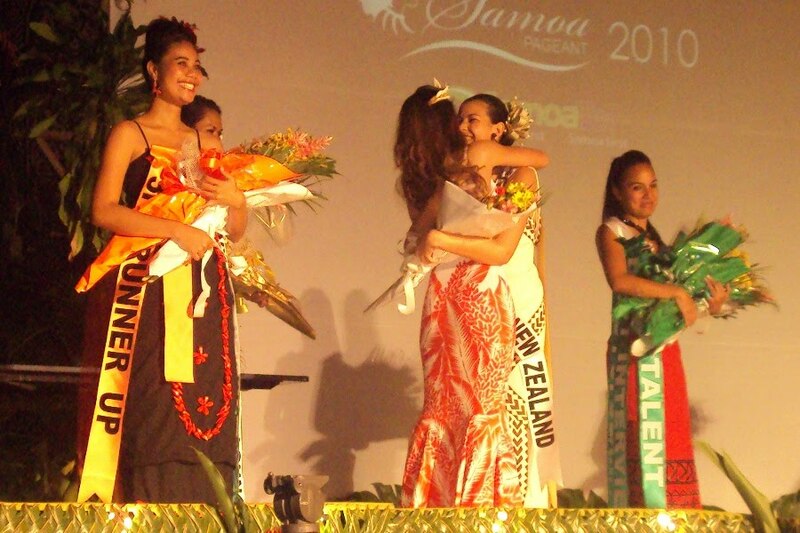 Miss Samoa New Zealand is named first runner up. 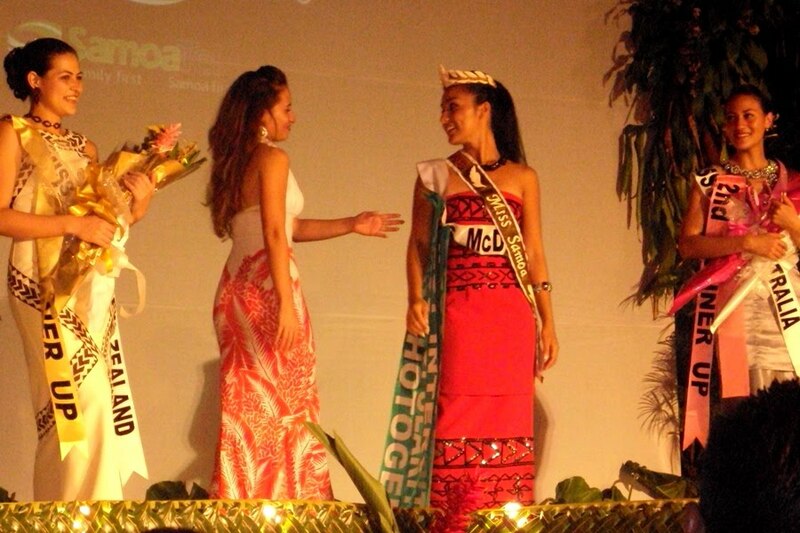 Miss McDonald's is named the new Miss Samoa for 2010. Miss McDonald's in the beachware portion of the competition. 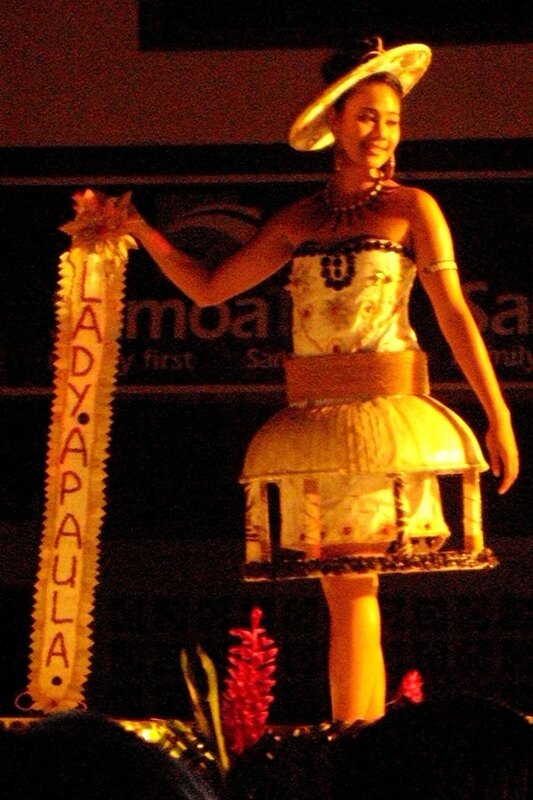 A closer look at Miss Apaula Heights Lounge's fale-skirt traditional wear. On this occasion, I was a googler; although, every so often, to get a small feel for what's going down in Samunda, your blog provides some sense of the happenings in that relaxed part of the world. Thank you for your update. I'm also a googler. hahaha!! Much Alofas from Utah!! Curious to see what your thoughts are on the Miss Samoa pageant this year. How were the interviews etc? Thanks for the pics. Beautiful costumes once again. Much love! god bless and keep up the good work!Faafetai Lava! Talofa lava, thank you for the pictures I'm glad I stumbled across your blog. I'm glad to see some pictures of the pageant. 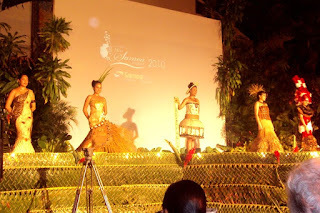 I was hoping to be there but I had to leave Samoa the week of the pageant...arrggh for business reasons. Anyway did you manage to attend the body building competition too? If you did I'd like to see some pictures if you have any. I miss Samunda but don't worry I'll be back soon...faafetai lava. Thanks Matt for the lovely pictures.Regardless of living away from Samoa but it's great to see what's happening back in the islands. Keep up the great work & Good Luck! woa! many thanks to you Matt for the job well done, I'd rather repeat seeing more of your upload flics than going thru the whole net trying to find the latest of the 2010 pageant in samoa.. i've certainly enjoyed seeing them as the flics is much better when it's taken closer.. i had a clear and better view of all the puletasi, local style the contestants were wearing.. lovin' it!! thanks and take care.. looking forward to ur next event on your blog.. Faafetai lava!